These new sinks are available in undermount models and feature thick, smart-looking front panels. Q: We plan to get rid of our tile kitchen counters and replace them with stone. While our counters are in bad shape, the cabinets look great and will stay. I really want a contemporary sink with an apron front. But my husband says no way, because an apron-front sink requires very aggressive cutting of the base cabinets. We are on a budget — any ideas? 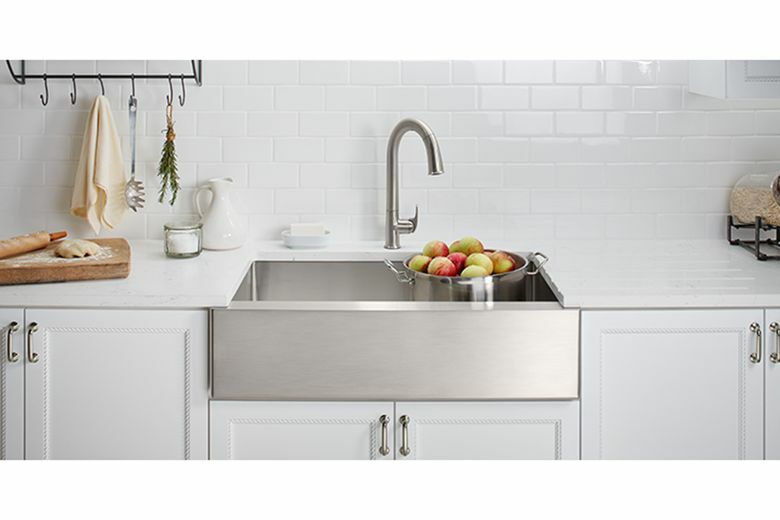 A: First, if you want a contemporary looking apron-front or farmhouse sink, look into stainless steel farmhouse-style sinks. These new sinks are available in undermount models and feature thick, smart-looking stainless steel front panels. Other features can include deep bowls, built-in sound-absorbing pads, and custom-made mats to protect the sink bottom. Now for the really good news: New technology makes some farmhouse sinks available in a self-trimming design. Usually only a simple rough cut is needed, since the special apron front overlaps the cabinet.